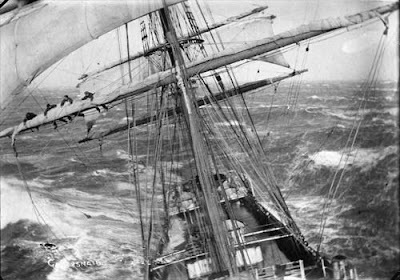 As an island nation it's no suprise that New Zealanders have carried on the sea shanty traditions of our first European arrivals and written plenty of songs about the ocean and seafaring. While we're all familiar with songs like 'Six Months In A Leaky Boat', 'Easy Come Easy Go (The Interislander Song)' and the cringe-inducing 'Sailing Away' there are many other songs about the sea worthy of intention. The Renderers live in Port Chalmers on the Otago Harbour, which was for a time also the home of David Mitchell and Denise Roughan of the 3Ds. 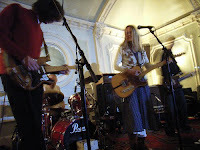 The 3Ds second EP was Swarthy Songs for Swabs and I have alcohol blurred memories of attending a launch gig where they played on a mocked-up pirate ship. The duo also released a number of singles under their own names and as Ghost Club. 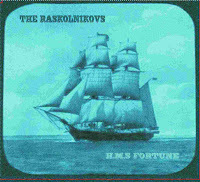 In 1991 they released a single which featured the B-side 'Grey Funnel Line', a folk song about the Royal British Navy. It's an amazing version of the song combining a pretty straight take on the vocals from Roughan with Mitchell's trademark hunched-in-front-of-the-amp guitar storm. You might be able to track the song down on the Xpressway Records compilation Making Losers Happy. Sea shanties have also been tackled by Robert Scott of The Clean and The Bats. In 2004 he released an album of folk songs, Songs of Otago's Past. When I heard Scott was recording this album I was keen to hear how he would take the old songs and add his own musical style. In the end I felt the album was a little disappointing as it was actually pretty traditional. To my ears the best in this collection is a song from 1900, 'Whaler's Rhymes', where Scott is accompanied by Alan Starrett on a contemporary wheezing ships harmonium. If you take a listen to the podcast you'll also hear a song from H.M.S. Fortune, the second EP from Wellington band The Raskolnikovs, who could be described as a mix of Eastern European folk music and Nick Cave's Murder Ballads; 'Sea Shanty' a song from Werecat Lullabies, the debut album from the great Christchurch indie folk duo Ragamuffin Children, winners of a Counting The Beat Alternatui last year; new, but very traditional fare from The Maritime Crew, the resident musical act at the National Maritime Museum; and a rendition of the first NZ sea shanty, 'I've Traded With The Maoris'.You'll find the video for 'Six Months in a Leaky Boat' on the video page and more on sea shanties here.